Washington, D.C., has the highest percentage of bicycle commuters. Across the nation, 74 percent of bike commuters are men. September 24, 2012, 3:35 p.m.
Commuting to work by bicycle is a great way to exercise and support the environment, but different states embrace it in different ways, according to a new interactive map put out last week by BikeGuard, an online bicycle registry. According to the map — which uses statistics and data from the 2010 American Community Survey conducted by the U.S. Department of Commerce — the highest percentage of bicycle commuters is in Washington, D.C., where 3.13 percent of workers take bikes to their jobs. On the far end of the spectrum, Arkansas has the lowest percentage of bike commuters: just 0.06 percent. The map — which lets you view the results in any U.S. state — also displays how much each state spends to fund cycling and pedestrian projects on a per capita basis. The highest amount was in Alaska, which spent $10.79 per person on biking and pedestrian projects. Despite its proximity to D.C., Maryland had the lowest per capita spending: just $0.45 per person. You can also use the map to see how much bike commuting has grown in the past few years. In the District of Columbia for example, usage of two-wheeled transportation methods has nearly doubled from about 1.75 percent since 2005. The detailed information on each state also comes with several links to blogs and other resources where you can find out more about bike commuting in your area. The information also shows how bike commuting rates vary by gender. 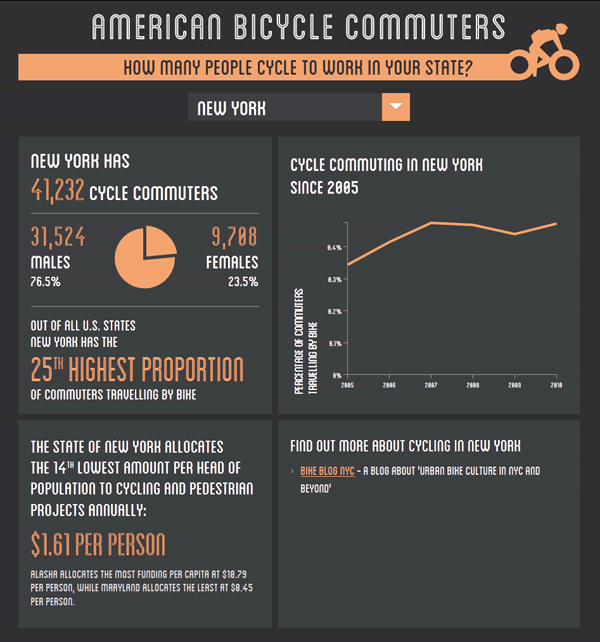 Nationwide, the data shows that 74 percent of bike commuters are males, compared to just 26 percent who are female. This isn't always the case: In Idaho, for example, the ratio is 56.8 percent men to 43.2 percent women. "We're really surprised to see some of these findings," BikeGuard creator Rivka Fogel said in a prepared release. "We've been hearing about the relatively few women biking to work, but seeing it reflected in hard numbers is a different thing entirely." The original Department of Commerce data doesn't get into the reasoning behind people's commuting choices, but it does reveal that more women take public transportation than men. A 2011 survey (pdf) by the Association of Pedestrian and Bicycle Professionals looked at why fewer women take bikes to route and found that convenience and a lack of bicycle infrastructure were the top two excuses (22 percent and 14 percent, respectively). Other reasons cited included kids, motorist behavior, and poor enforcement of traffic laws that would protect bike riders. Another survey conducted by members of VeloGirls, a San Francisco-area cycling club, found that women did not commute by bike when they had too much to carry, when the weather or lighting were bad, when they did not feel safe on the roads, or if their workplace did not offer an easy alternative for them to clean up or shower after a bike ride. Click image to open interactive version (via BikeGuard).